Stop me if you've heard this. 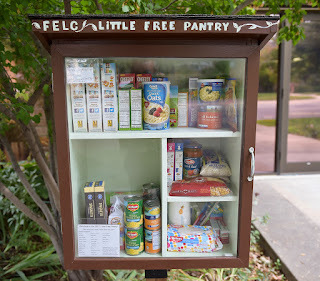 Some kids in our neighborhood built a community food pantry, and I am in love. Last weekend, I was driving down Wedgewood, a fairly decent artery that runs basically East/West. It becomes Blakemore, then 31st Ave, then eventually dies at Charlotte Pike. Anyway, In my neighborhood, it's still Wedgewood. And there's this tiny Church located at the dog-leg where Acklen shoots off like a capillary (to carry on the circulatory theme). Some kids were putting the finishing touches on a food pantry. It is a stand-alone cabinet - roughly four feet wide, five feet high and shelves. It has a double door front - the doors are framed plexiglass. They latch shut with a hook and eye gadget at the top and bottom. The kids painted it sky blue with some artwork on every blank surface. It's adorable. Like this, but way cuter. Anyway, they were finishing up last Sunday, so while I was at the store, I picked up a few things for the pantry. Cans of tuna, beef stew - the basics. Some of the kids were still there when I went to drop off my offerings. According to the mother in charge, I made their day. Nah - they made someone else 's day. I just want to give a little. As fat as I am, it is unconscionable that anyone in our country ever want for something to eat. So, I'll be adding to the supply each week. It's pretty solidly turned over from last week. I added some canned hams for the holidays, and some small packets of granola and energy bars. I get the feeling that the people utilizing it are one-off homeless folks who need a bite or two. Maybe some families who may need to flesh out a meal. I don't honestly know. I will sat that the toilet paper and toiletries are all gone. I may put some feminine hygiene items in there next week. Or socks. I don't know. What I do know is that I enjoy thinking about what folks might need, and trying to help. My plan for 2018 is to try and fight hunger, one week at a time. And it's also to lose some more damn weight. I mean you can be generous about others and still selfish when it comes to you. If you have a community little pantry, or even a big one - think about giving. I bet you have something in your cabinet you could part with. I know where that is! That's pretty cool and exciting that there's a food pantry there. Although I can honestly say I gave at the office I'm going to go and put something in this pantry too. I do like to spread the goodness around. It's why I've been known to have five or six copies of the same issue of The Contributor.